I just got back in town and I’m finally getting a chance to write about last weeks adventure. It was another cold week but it turned out Great!!! We had Fun, Fun, Fun from start to finish, and I mean we had a BLAST!!! Wish you all could have joined us!!! The temperature was again in the mid 40′s so snorkeling was out, but that didn’t stop us from having Fun! Not this group of Adventurers either! When I arrived at the dock they were ready to go and looking for Adventure and we were going to have it! I could just tell! With 4 full days of boating, fishing, island exploration and unbelievable manatee encounters, etc., how could you not? Group Photo - Island Adventure! I arrived at the dock bright and early Monday morning and everybody was already there and smiling from ear to ear! Just the way I love it! I could tell they were ready to go have some Fun! As soon as AdventureMegan, McKenzie, Dylan, Gisele, Julianne, Sienna, Alex, Maxwell and Matthew boarded the boat we were off and going. 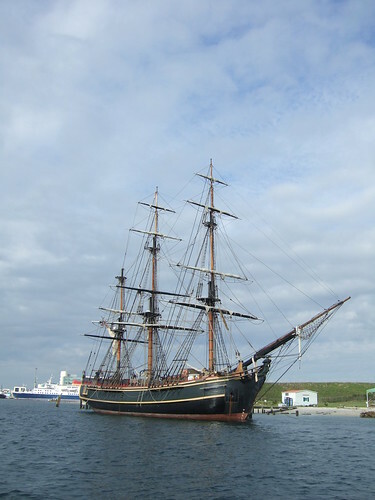 Like last week, we decided to make a quick trip over to the HMS Bounty to show the group what life was like aboard a pirate like vessel. And as usual, we all thought the ship was cool and a great way to start the day! We decided to take a hike around Peanut Island, explore the lagoon and walk the beach looking for shells and sea beans, etc. We saw some big pufferfish and eagle rays along the rocks of the lagoon and watched a few nice black snakes chasing lizards for a meal. We had fun collecting knickerbeans and saw a big Cushion Starfish on the beach that everyone checked out. It was just great! We even saw a few manatees swimming down the beach heading towards the FPL power plant to warm up. What a lucky encounter! We were loving this and wanted to see them up close and personal!!! We didn’t know then how lucky we were going to be. We decided to spend most of one morning going over towards the FPL power plant and see if we could find a few manatees warming up in the hot water coming out from the plants cooling pipes. Little did we realize just how, pardon the pun, “COOL” that was going to be! 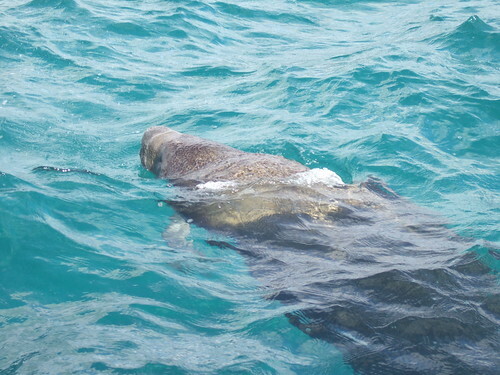 And what to our wondering eyes did appear, but manatees, manatees from here to there!!! As soon as we got close we could see dozens of manatees all around! There with Big Ones, Little Ones, Short Ones, Fat Ones, you name it, we saw it, and even some with new born calves, and the water was crystal clear!!! What a wonderful opportunity the chilly weather gave us! 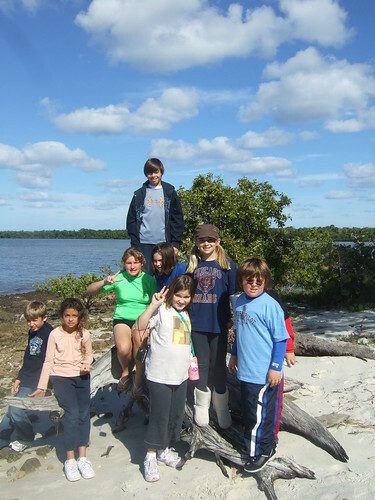 A chance to watch and observe large groups of manatees right under our noses! It just doesn’t get any better than this!!! UNBELIEVABLE!!! The best I’ve ever seen!!! I just couldn’t believe what we were seeing! I anchored the boat nearby and raised the engines out of water. 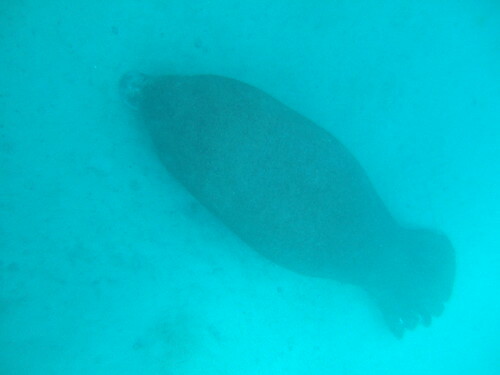 Before we knew it, we had manatees right under and all around the boat . So close you could almost kiss them on the nose! And if I could of, I would of… We all would have!!! Everyone of us wanted to get in the water with them but I knew it wasn’t allowed, but did we EVER want to!!! 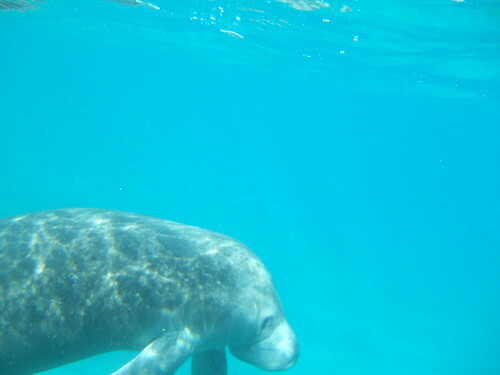 I had never seen so many manatees up this close and in such clear water as we were experiencing now. I will never forget it and I’m sure this group of Adventurers won’t either!!! Right then and there we would have given just about anything to get in the water with them! It seemed they were begging for us to get in! We saw quite a few mothers with new born calves just a few feet from the boat! A couple of baby’s would swim over to the anchor line and rub up and down against the line scratching their backs and bellies! 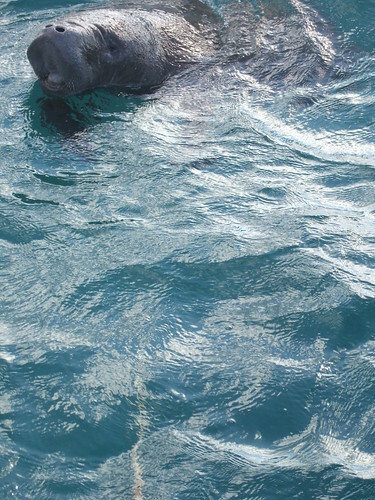 A few times I ws able to just reach over the side of the boat with my underwater camera and snap a picture or two of one taking a closer look at us. They were so close I couldn’t get them all in the picture, I needed a wide angle lens! Were we ever having FUN now!!! I think a few were just as curious about us as we were about them!!! And like I said before, “It Just Doesn’t Get Any Better Than this!! !” Yippeee!!! We could have stayed here the rest of the week and had the time of our lives, but I knew there were other things the kids would love to do too! Like the Island Exploration and the Fishing Days and I couldn’t wait for them either! There was just too many things to do and places to go have fun and I knew we weren’t going to be able to do all of them no matter what. We took an Island hike thru and all around Big Munyon Island. 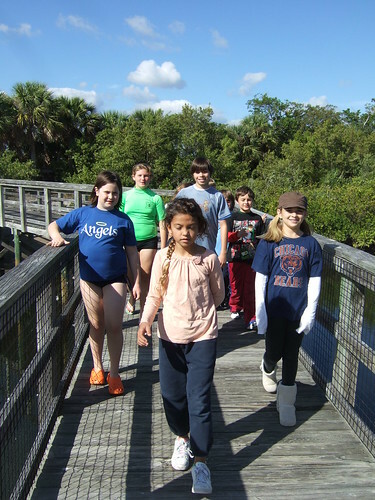 We started at the boardwalk and talked about the different species of mangroves and sea grasses found in the lake Worth lagoon and the critical role they play in providing habitat for the juvenile fish, invertebrates and crustaceans that call them home. As we hiked the island, I pointed out the wild coffee and grape vines and numerous butterflies we saw. 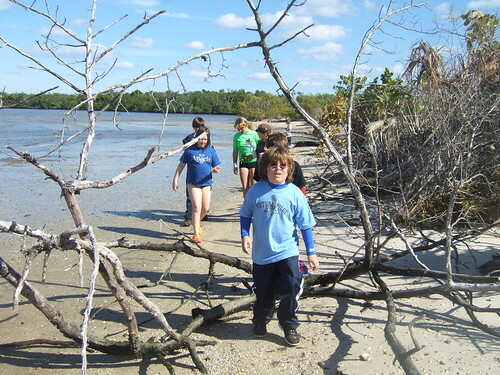 We had a chance to explore all around the shallows and mangrove estuaries as the tide was dead low. We found a few molts or shredded carapaces of horseshoe crabs and collected some nice land hermit crabs too. Along the hike we had to duck under the webs of extra large banana spiders that were eating moths and bumble bees and I could tell the group was having fun every time I ran face first into one as well! Along the beach we found some nice living crown conchs and large sea grass hermit crabs that we checked out too. We spent two full days fishing and I can tell you everybody LOVED THAT! As Usual the fishing was non-stop!!! Lucky for us we have a few fishing spots that are just unbelievable and always produce large numbers of nice fish!!! And like I’ve said before, “It just doesn’t get any better than this!! !” I can’t describe just how much fun and full-filling this day and this job was to me, especially when AdventureMaxwell looked up to me with this huge smile from ear to ear and said, “This is the very best day of my Life, It can’t get any better than this!” My thoughts exactly Max!!! Max catches a Sailor's choice! I’m always so busy on fishing day I never get a chance to take all the photos I want of the group or keep track of who caught what and how many fish everyone caught. I just know that the second the bait hits bottom something wants to eat it. It may take a little bit for the group to get the hang of it, but before long they’re fishing like pro’s!!! Everybody always gets fish, and sometimes, hundreds! 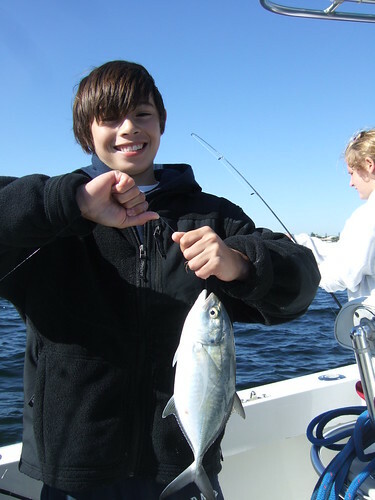 Dylan Catches a Big Fish! 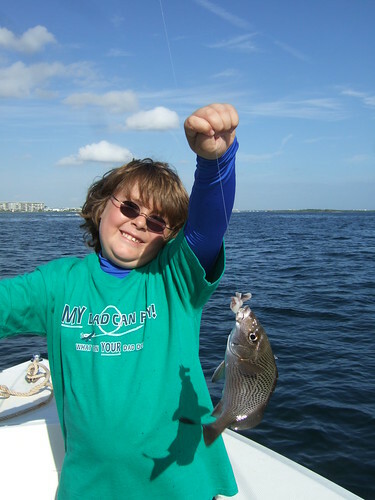 We have contests to see who catches the biggest fish, the smallest fish, the most fish, the prettiest fish, etc. It is just great and everyone loves it! Every now and then someone catches a scorpionfish and you get points deducted for that, especially since I take them off. Its all in the name of FUN and that’s what counts! 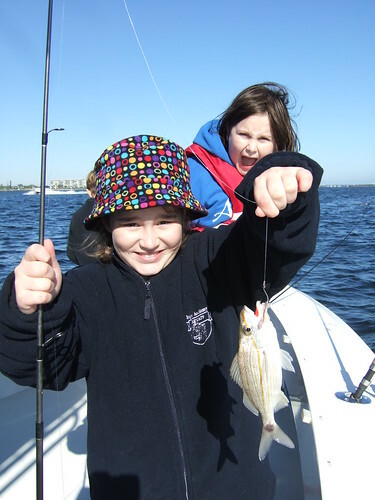 Sometimes a big blue runner will grab the bait and the kids will have to fight hard to bring them in on small tackle. Always fun to watch! Alex catches a Blue Runner! Most of the time I am so busy I can’t keep up with all the action! Lucky for me some of the kids will help bait hooks or take off fish. I make a deal with them if you bait your own hook and catch a fish, I’ll give it a kiss. Before long they are all baiting hooks and I’m not reminding them I have to kiss the fish. Kinda sneaky I know, but every now and then they remember and kiss the fish I do! A deals a deal! It took a bit for me to convince Sienna, but before long she was baiting her own hook and catching fish and I was having to kiss those too. See, it wasn’t all that bad . YOU ROCK!!! 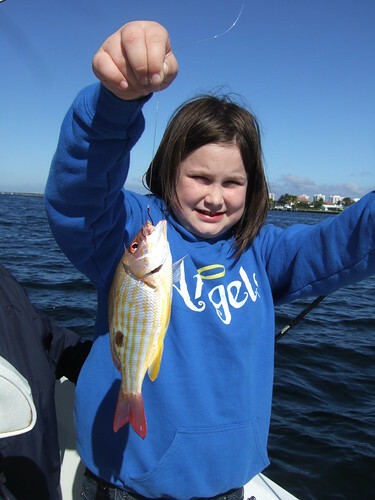 Sienna catches a Lane Snapper! The cool thing about this time of year, besides the temperature and water of course, is that many fish come down from up north following certain temperature gradients. This gives us an opportunity to catch different species of fish than we would in the Summer. 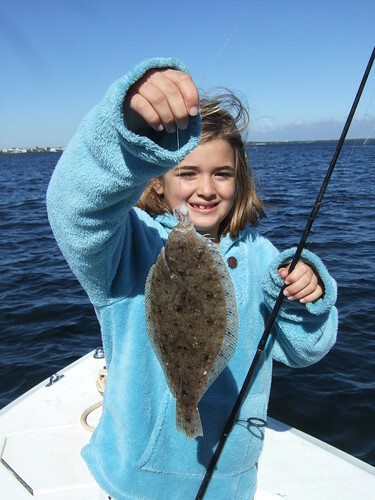 Its always exciting for everyone to catch their first flounder and discover that it has two eyes on one side and none on the other! As a small frye it has an eye on each side of the head and swims upright, but shortly after that, the flounder settles to the bottom and lays flat and one eye migrates over to the top side. Now how cool is that! The last hour of the day we went to Starfish Prairie and Julianne jumped in and collected a few big Cushion Starfish for us to take a quick photo opportunity before we released them exactly where we found them. I love this spot and so do the kids. Needless to say, the week flew by faster than we wanted and none of us was ready to call it quits! No matter what the water or air temperature was, We had so much FUN!!! We never wanted it to end!!! Never!!! Somehow it always seems to be this way, and I just LOVE IT!!! Lucky for me I get to do it all over again when I start my Spring Break Adventure Sessions in March and April! Registration emails will go out soon! It just doesn’t get any better than this! I love this job!!! I just can’t wait!!! It’s always a BLAST for everyone!!! Hope to see you there! this week was so much fun!!!!!!!!!!! 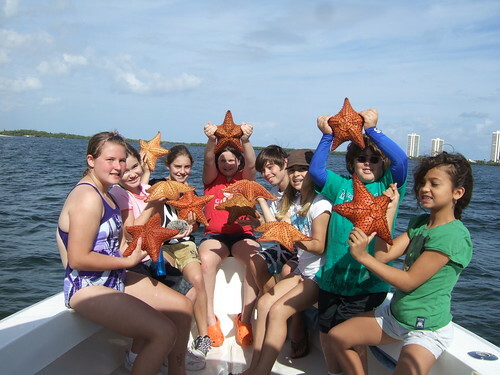 im the girl holding the star fish in the purple bathing suit. but it was so much fun everyone was nice. and even though we could not go in the water(because it was so cold)we still saw some amasing things like i bet that we will never see manitees like that day. and mike made it so easy to fish i have never fished in my life but i still got 13 fish in one day!!!!!! SEE YOU IN THE SUMMER MIKE!